In the summer of 2009 I was living in Japan and went on a short break to the island of Guam. 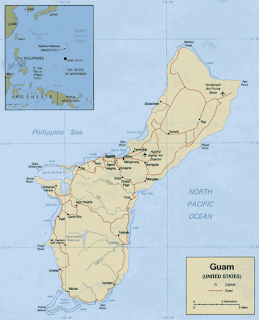 Guam is part of the Mariana Islands of Micronesia in the western Pacific Ocean. Nowadays it is a territory of the United States, but is thought to have been first settled by people migrating from south-eastern Indonesia around 2000 BC. The island still has several sites of prehistoric remains from the early ancestors of the native Chamorro population. The Portuguese explorer, Ferdinand Magellan (c.1480-1521), was the first European to visit Guam. The island later came under Spanish colonial rule, and they administered the island until it was ceded to the U.S. in 1898. 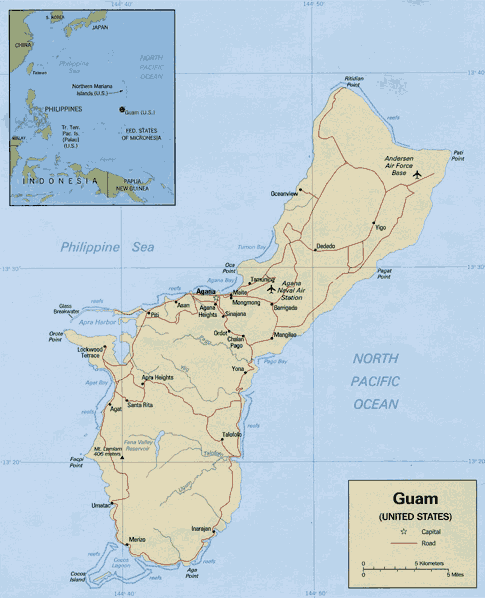 Guam, as an island of strategic importance, was occupied by the Japanese during the Second World War and today it is still characterised by a large U.S. Military presence. It’s also famous as one of the islands on which lone Japanese soldiers held out long after the war ended in 1945. Sergeant Shoichi Yokoi was one of the last of these surviving 'hold outs', who rather than surrendering had remained for years alone in the jungle. Remarkably he didn’t surrender until he was finally captured in 1972. What follows is an account of a day’s jungle trekking I undertook to the San Carlos falls in the interior of the island. “July, 19th 2009 … Our trek began on a highland ridge where we found lots of wild orchids growing. Our trail went on through tight arches of sword grass. We saw a waterfall in the distance amidst grasslands. Wending further on we came to a tree standing alone on a ridge that was gently whistling in the slight breeze. From here we descended down to a band of lush green which just suddenly seemed to appear before us. This was where the jungle began and immediately upon entering the dense greenery we found ourselves clambering down a steep slope clinging to a rope as we went. This was where the trek really began proper, as from here on it was increasingly tough going. The climate markedly changed too, from the cool temperate highland to the hot and humid verdant enclosure of the jungle. We reached the first waterfall at its top and looked down to the pool below. It was a beautiful view of a tropical jungle scene. We climbed down ropes to the side of the falls to get to the pool where we swam and stood beneath the falling water. Here fish swam up around our toes and we could see freshwater shrimp scuttling over the rocks below the surface. From here onwards we trekked down the river, walking in the river-stream itself, until we came to the point where our river joined another, we then trekked far up this other river, eventually back to the grasslands again, taking the whole day to do so. Our second waterfall wasn’t so tall or so picturesque, but rather the falls, the overhang, and the pool were wider. The pool was also much deeper, which meant we were able to jump from the overhang into the water below. Everyone in our party made the jump. It was certainly a blind leap of faith for me, as without my specs on I couldn’t really see where I was going until I actually got there! Swimming in natural freshwater pools is a wonderful, enchanting experience. The water of the first waterfall was cool in temperature and so a welcome relief from the jungle heat; the second waterfall though, being wider and more exposed to the sun, was wonderfully warm, like a natural bath. Our jumping into the pool far below put me in mind of Alex Garland’s novel ‘The Beach’. We stopped here for lunch. After lunch we continued upriver, over seriously slippery rocks – all of us, including our guide, each took several slips along the way; one of my slips resulted in a purple toe and a sprained wrist which made going on all the more arduous (I later realised that I’d actually broken my toe!). At one point along the river a large black monitor lizard with tiny yellow dots all over its body fell into the river between me and our guide, who was next up ahead. Our guide gently clapped his hands to encourage the lizard to swim down the narrow stream in our direction. The lizard reached to within a few feet in front of me before it saw the others coming up behind me. It doubled back and then slowly climbed out of the stream, and up the steep bank back into the jungle. The lizard must have been around 1.5 metres long from nose to tail. It was one of the most astounding things I have ever seen or experienced. In several places the river made for very deep wading. Further up we came to a bend which was a tall, curving cliff in which the layers of a former molten lava flow could be seen. We stopped here a while to cool off in the stream. The heat certainly made things hard going.